The genus Nylanderia (Hymenoptera: Formicidae: Lasiini) currently includes 134 valid species and subspecies worldwide (LaPolla et al. 2010). Fifteen described species, including nine native and six introduced species, have been collected in the continental United States (Bolton et al. 2006, Trager 1984, Meyers 2008). Formerly, Nylanderia was considered to be a subgenus of Paratrechina andwas only recently elevated to the generic level by LaPolla et al. (2010); consequently, it is referred to as Paratrechina in most of the literature. In 2002, large populations of an unknown Nylanderia species were discovered in Houston, Texas. 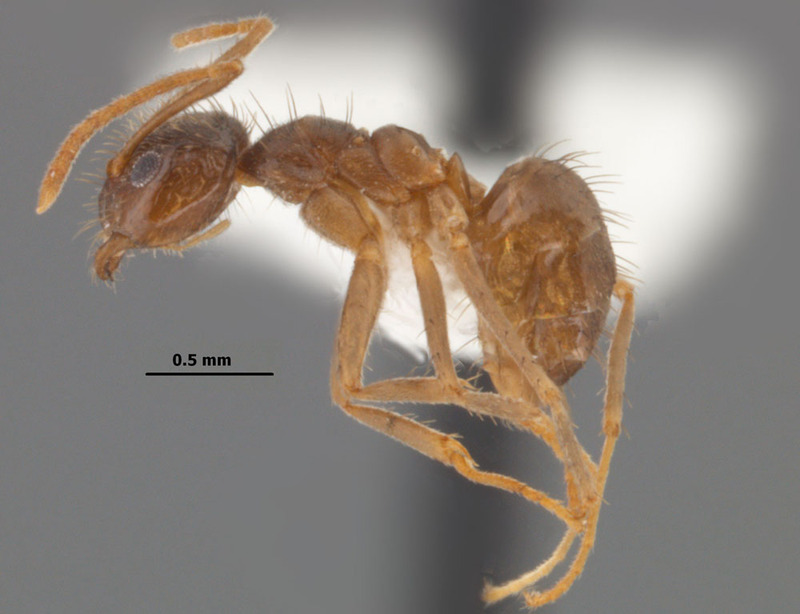 After examination by taxonomic specialists, these ants were determined to be similar to Nylanderia pubens, the hairy crazy ant (Meyers 2008), known to occur in the Neotropical Region and in Florida (Wetterer and Keularts 2008), and similar to N. fulva (Mayr), which is native to South America (Meyers 2008). However, due to taxonomic uncertainty, this species has not been definitively identified as N. pubens, N. fulva or any of its eight subspecies, or even as an undescribed species. Therefore, at this time it is being identified as N. sp. near pubens (Meyers and Gold 2008), but it could also be referred to as N. sp. fulva group. It has been given the common name of the Rasberry crazy ant in honor of Tom Rasberry, the pest control operator who first discovered it in Texas; however, this common name might change when the identity of this species is determined. Future morphological and genetic studies might resolve the correct identity of the species, although a complete revision of the group will probably be necessary to resolve the identities of the inclusive species. Regardless of its taxonomic status or common name, N. sp. nr. pubens has become a serious invasive pest in Texas, and since its initial detection in 2002 it now occurs in 14 counties (Drees et al. 2009, Rasberry 2009). The related N. pubens and N. fulva have been equally problematic in parts of Florida and the Caribbean Islands (Warner and Scheffrahn 2004, Wetterer and Keularts 2008) and in parts of South America (Meyers 2008), respectively. Recently, large populations of a species of Nylanderia that appears to be identical to N. sp. nr. pubens from Texas were detected in Hancock County, Mississippi. Rasberry crazy ants often occur in tremendous numbers and display supercolony characteristics in which individual colonies do not exhibit mutual aggression toward one another. Individual colonies are polygynous, with nests typically found in a variety of outdoor habitats in rotting wood, in soil, in and under various types of debris, under bark, in potted plants, in vehicles, and in structures. They are less active during cool months, but populations grow rapidly in the spring and increase in size throughout the summer and fall. Rasberry crazy ants are omnivorous, but appear to prefer sweet liquids especially, such as those produced by various hemipterous insects (aphids, mealybugs, scale insects, etc.) and nectaries of plants. They supplement their diets with arthropods and small vertebrates for protein (Meyers 2008). At this time, the economic and ecological impacts of this species are not fully known. In general, the Rasberry crazy ant is a nuisance pest. The high densities of foraging workers in affected areas make day-to-day activities uncomfortable, if not impractical. This species does not sting, but is capable of inflicting a bite. In Colombia, the related N. fulva is considered a serious pest that has displaced native fauna and caused grassland habitats to dry out as a result of elevated hemipteran levels on plants (Arcila et al. 2002, Meyers 2009). In Texas, large accumulations of Rasberry crazy ants have caused short circuits and other problems in electrical equipment and sewage pumps (Meyers 2008). Beekeepers in Texas have reported that honey bee hives have been destroyed by this ant species. Reports state that the ants were more interested in the bee larvae than they were in the honey. After killing or driving the bees away, the ants then used the hives for their own colonies (Harmon 2009). All castes of Nylanderia sp. nr. pubens are concolorous reddish-brown. Workers (Fig. 1) are approximately 2.0–2.3 mm in length, males (Fig. 2) are slightly larger (2.4–2.7 mm), and queens (Fig. 3) are approximately 4.0 mm or longer. Workers lack ocelli, have dense pubescence on the alitrunk and gaster, and have long, somewhat flexuous, light brown macrochaetae on the body. Workers of N. sp. near pubens are similar to specimens identified as N. pubens from Florida and N. fulva from South America. The only other species of Nylanderia in the southern United States having dense pubescence on the alitrunk are N. bourbonica (Forel) and N. guatemalensis (Forel). Workers of Nylanderia bourbonica are larger, concolorous dark brown, and have ocelli; whereas, workers of N. guatemalensis are yellowish-brown and have a glabrous pronotal disk, with the sides of pronotum usually glabrous as well. In the field, Rasberry crazy ants superficially resemble Argentine ants, Linepithema humile (Mayr), but can be differentiated by their slightly larger size, reddish color, and erratic foraging patterns. Under the microscope, they are easily distinguished from Argentine ants by their reddish-brown coloration, the presence of an acidopore at the tip of the gaster, and numerous erect, thickened, elongate setae on the body and antennal scapes. Figure 1. Nylanderia sp. near pubens, profile view of worker. Figure 2. Nylanderia sp. near pubens, profile view of male. Figure 3. Nylanderia sp. near pubens, profile view of queen. This species was first collected in Mississippi by a pest control technician at a residence in Waveland, Hancock County on 20 July 2009. Ants were reported to be in the garage, on the patio, and around the house, where they formed trails. Several individuals were mailed to the Mississippi State University Department of Entomology and Plant Pathology for identification. Upon examination and comparison to specimens from Florida and Texas, they were determined to be most similar to the Texas specimens. On 23 September 2009 another sample was received from Lakeshore, Hancock County. The homeowner reported high ant populations and requested control recommendations. These specimens also closely matched the species found in Texas, N. sp. near pubens. On 7 October 2009 we visited the site in Lakeshore at 30°16'31"N 89°25'57"W. As we drove along the graveled residential road, which was approximately 0.5 miles long, we noted the obvious presence of multiple ant trails on trees. We subsequently observed ants in wide trails in overwhelmingly large numbers in both open and wooded habitats on the ground, on tree trunks, on structures, and elsewhere throughout the area. The ants were so abundant that it was impossible to step anywhere on the property without having hundreds of ants rapidly climbing onto our shoes and lower legs. Numerous colonies with multiple dealate queens and alate males were discovered nesting in rotting wood, in soil, in and under debris, under bark, and in structures. The homeowners stated that the ants also had been nesting in their cars, a motor home, a motorcycle, in electrical boxes, and in the house. Repeated applications of various pesticides had no obvious effect on the large masses of ants present, with new colonies replacing those that were killed within days or hours. In Texas, the Rasberry crazy ant has already proven to be a serious invasive pest, as have its relatives in South America and Florida. Likewise, large populations in Mississippi have already caused problems for homeowners. Its incursion into Mississippi is not likely to stop in Hancock County, as this species is easily transported by commerce and personal transportation. Aggressive control measures and monitoring might be necessary to stem its movement. Thanks to Alex Wild (USDA-ARS, Urbana, Illinois), David Oi (Gainesville, Florida), Danny McDonald (Houston, Texas), and Richard Evans (USDA-ARS, Stoneville, Mississippi) for donating specimens for comparison. This article is approved for publication as Journal Article No. J-11734 of the Mississippi Agricultural and Forestry Experiment Station. 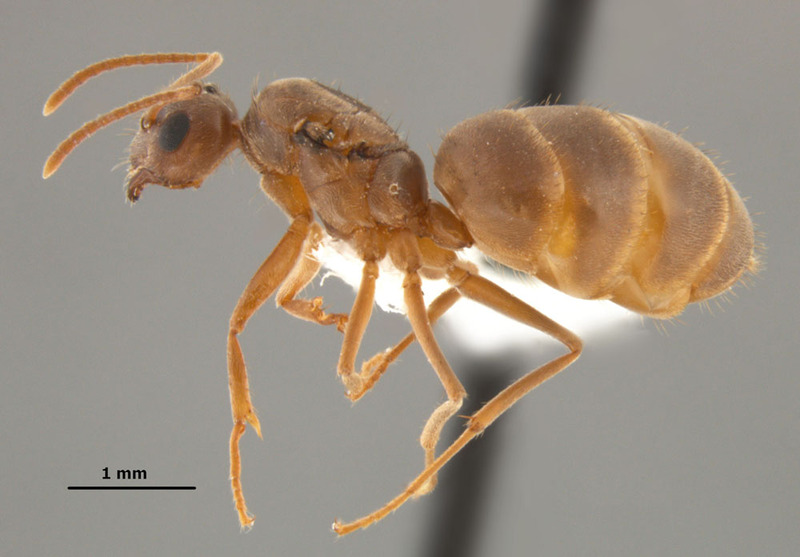 Research was supported by State Project MIS-311080 and the USDA-ARS Areawide Management of Imported Fire Ant Project (Richard L. Brown, Principal Investigator). Arcila, A. M., L. A. Gómez, and P. Ulloa-Chacón. 2002. Immature development and colony growth of crazy ant Paratrechina fulva under laboratory conditions (Hymenoptera: Formicidae). Sociobiology 39: 307-321. Bolton, B., G. Alpert, P. S. Ward, and P. Naskrecki. 2006. Bolton's catalogue of ants of the world: 1758-2005. CD-Rom publication. Harvard University Press, Cambridge, MA. Drees, B. M., P. Nester, and R. Gold. 2009. Control of Rasberry Crazy Ants In and Around Homes and Structures. Texas A&M University Fact Sheet. pp. 1-5. Meyers, J. M. 2008. Identification, distribution and control of an invasive pest ant, Paratrechina sp. (Hymenoptera: Formicidae), in Texas. Ph.D. Dissertation, Texas A&M University, College Station, TX. Meyers, J. M. 2009. Exotic Texas Ant, Paratrechina sp. near pubens. Texas A&M University Fact Sheet. pp. 1-4. Rasberry, T. 2009. Tom Rasberry's Blog: Rasberry Crazy Ants. On-line posting (http://crazyrasberryants.blogspot.com/2009/02/rasberry-ants-2009.html), accessed 4 November 2009. Trager, J. C. 1984. 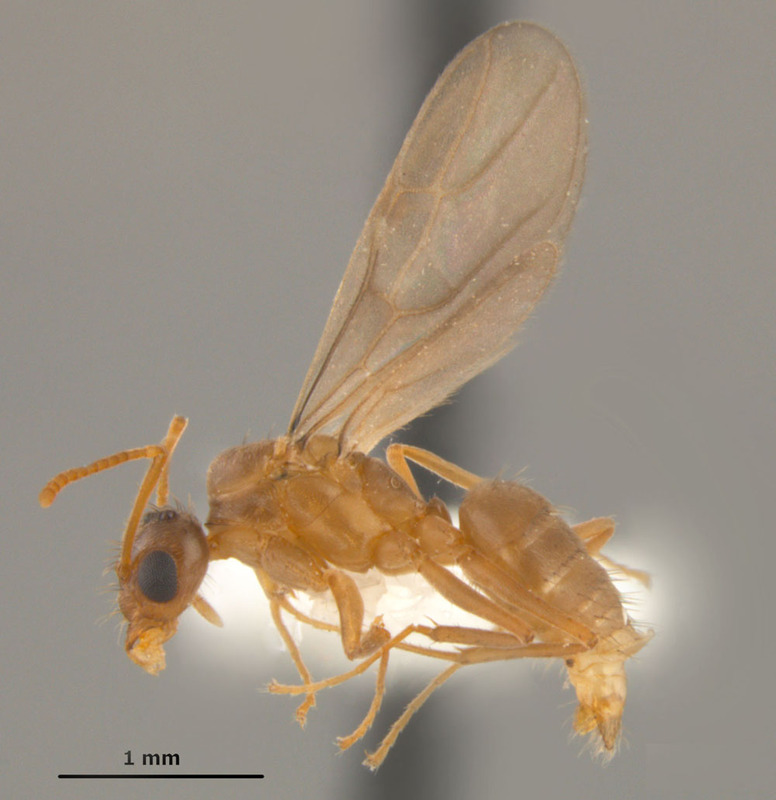 A revision of the genus Paratrechina (Hymenoptera: Formicidae) of the continental United States. Sociobiology 9: 49-162. Warner, J. and R. H. Scheffrahn. 2004. Caribbean crazy ant (proposed common name), Paratrechina pubens Forel (Insecta: Hymenoptera: Formicidae: Formicinae). University of Florida Extension Service publication EENY284. 1-5 pp.